Things were normally quiet and peaceful in the old mining town of Denney Springs, Colorado. That is, until the Environmental Protection Agency suddenly showed up in nearby Denver. A horrible mine accident occurred near the city when careless E.P.A. workers mistakenly released thousands of gallons of Widgetanium (a strange experimental chemical that was being tested by the U.S. government) into the city’s water system. By the next day, the contamination was widespread and infected residents were slowly turned into some kind of zombie-like monsters. There were even rumors of the recently-deceased being re-animated from the city’s morgue! 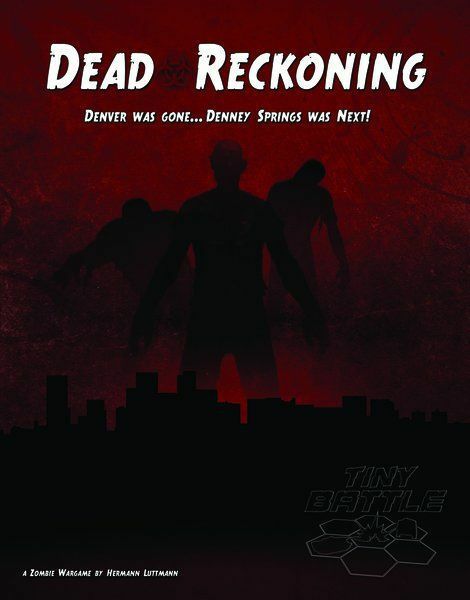 These “living corpses” soon took over the city and infected thousands of others as well. 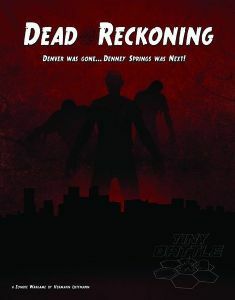 Slowly expanding out from the Denver city limits, the “Day of Reckoning” was finally upon the citizens of Denney Springs. At first, they were horrified and completely overwhelmed, losing hundreds of their fellow citizens. But the tough community eventually organized, gathered its resolve and fought back courageously. The majority of townsfolk were herded out in refugee columns and headed for the protection of the mountains. A series of distress calls were sent out, begging for help from the Colorado National Guard. A plan was arranged for full evacuation from a quickly-constructed Guard base in nearby Wagon Gap, on the other side of the mountain range. 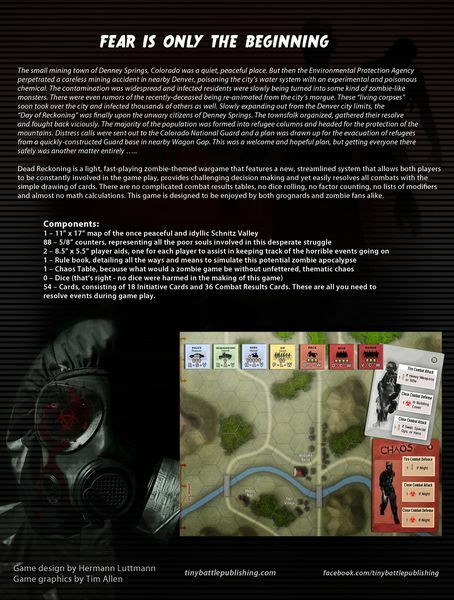 This was a welcome and hopeful plan, but getting everyone there safely was another matter entirely …..
Dead Reckoning is a light, fast-playing zombie-themed wargame that features a new, streamlined system which allows both players to be constantly involved in the game play, provides challenging decision making and yet easily resolves all combats with the simple drawing of cards. There are no complicated combat results tables, no dice rolling, no factor counting, no lists of modifiers and almost no math calculations. This game is designed to be enjoyed by both grognards and zombie fans alike.